Each twin has its own placenta (although sometimes they grow adjacent to each other) and amniotic fluid sac so this type is considered the lowest risk multiple pregnancy. They are diagnosed by a lambda (λ) sign on first-trimester ultrasound. DCDA twins occur if cell division occurs before day 4. Although the twins still have their own amniotic fluid sacs, this type of twins share a placenta which is considered higher risk as intertwin arteriovenous anastomoses may form resulting in potentially fatal complications such as twin–twin transfusion syndrome (TTTS) and twin-anemia polycythemia sequence (TAPS). They are diagnosed by a ‘T’ sign on first-trimester ultrasound where the two amnions meet. 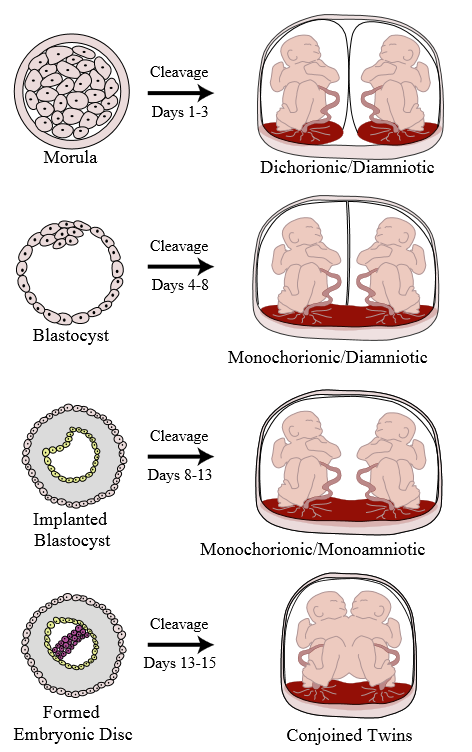 MCDA twins occur if cell division occurs between days 4 and 8. These twins share a placenta and an amniotic fluid sac, so they are considered the highest risk owing to not only the risks associated with monochorionicity as per MCDA twins, but also they are at high risk of cord entanglement. There is no dividing membrane seen on ultrasound. MCMA twins occur if cell division occurs between days 8 and 13. These twins are fused together by various body parts and are very rare with an estimated prevalence of 1/45,000–200,000 births.6 Approximately 40% of conjoined twins will be stillborn, and 35% will die within the first 24 hours of life. Survival is heavily influenced by which body parts are fused. Conjoined twins occur if cell division occurs after day 12. These multiple pregnancies may have different combinations of chorionicities and amnionicities, and include singletons as well. If the couple is considering selective reduction, the chorionicity and amnionicity will play a role in determining which multiple to terminate. (See Higher-Order Multiple Gestations chapter for more information). Various factors are thought to be associated with multiple gestations, some of which are more evidence-based than others. There does appear to be a link between the factors and a potential endocrine origin, which fits with the superovulation which occurs with DZ twins. The majority of twins are conceived naturally, whereas higher-order gestations are mainly conceived through ART.1 It is estimated that approximately 20% of twins in the UK Millennium Cohort study were conceived using ART.12 However, the rate of UK in-vitro fertilization (IVF) pregnancies resulting in a multiple pregnancy has decreased dramatically from 27% in 2008 to 16% in 2014, owing to the introduction of single embryo transfer (SET) guidance if embryos are top-quality.8 However, increasingly UK couples are travelling abroad to have ART where SET is less encouraged, and consequently couples are returning to the UK with higher-order multiple gestations as more embryos are often transferred, and the numbers of higher-order multiple pregnancies are rising. This is despite the SET policy appearing to have no effect on cumulative pregnancy rates.13 One factor which affects the chance of having a multiple pregnancy is the type of ART, as described by Professor Keith in the ‘Higher-Order Multiple Gestations’ chapter. Clomiphene is a selective estrogen receptor modulator (SERM) prescribed to women with sub-fertility owing to anovulation or oligo-ovulation. It works by blocking estrogen receptors in the hypothalamus, thus inhibiting the negative feedback of estrogen, which increases the levels of follicle-stimulating hormone (FSH) and luteinizing hormone (LH) and induces ovulation. Women who take clomiphene have a 10% chance of having a multiple pregnancy, compared to the UK background risk of 1.56%. 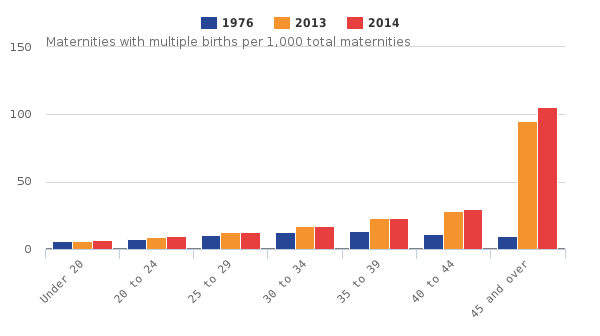 The average age of women at childbirth in industrialized countries has been increasing steadily for approximately 30 years.14 Between 1996 and 2006, births to women 35 years of age or older in the United Kingdom increased from 12% to 20% of all births.15 In 2006, a total of 5.6% of live births in the United Kingdom were to nulliparous women 35 years of age or older. Increased maternal age is associated with a higher incidence of multiple gestation births, as demonstrated by Figure 1. This is partly owing to the higher rate of ART in these women, but it is also thought to have a biological basis.11 The reason for this is unknown. There does appear to be a genetic element to twinning with the trait being passed down both the maternal and the paternal side.11 Specific genes associated with DZ twins are beginning to be identified, and support that twinning is related to ovarian function. A study by Basso et al. which used the Danish National Birth Registry reported a statistically significant association between women with a BMI ≥30 (OR 1.44, 95% CI 1.13–1.83) having a higher rate of naturally conceived twins, and women with a BMI <20 (OR 0.71, 95% CI 0.57–0.90) having a lower rate of naturally conceived twins even after correcting for maternal age and parity.19 They also found that taller women were more likely to have twins. Multiple gestations are occurring more frequently as a result of increasing use of assisted reproductive technologies (ART), delaying pregnancy, increasing maternal age and immigration. Other factors associated with multiple gestations include parity, geography and family history. Chorionicity and amnionicity are vital as they determine the course of antenatal care owing to differences in associated risks. Zygosity explains the biological mechanism of the twinning with monozygotic twins developing from one embryonic mass, and dizygotic twins forming from more than one oocyte in the same menstrual cycle. Multiple gestations created by ART are more likely to be dizygotic, although with the introduction of the single embryo transfer guidance the rate of ART twins in the UK is decreasing. Fiona L. Mackie is funded by the Richard and Jack Wiseman Trust (charity number 1036690). ONS. Birth characteristics in England and Wales: 2014: Office for National Statisitcs; 2015 [Available from: http://www.ons.gov.uk/peoplepopulationandcommunity/birthsdeathsandmarriages/livebirths/bulletins/birthcharacteristicsinenglandandwales/2015-10-08#background-notes. Hillman S, Morris R, Kilby M. Co-twin prognosis after single fetal death: a systematic review and meta-analysis. Obstet Gynecol. 2011;118(4):928-40. Mackie FL, Morris RK, Kilby MD. Fetal Brain Injury in Survivors of Twin Pregnancies Complicated by Demise of One Twin: A Review. Twin Res Hum Genet. 2016;19(Special Issue 03):262-7. NICE. Multiple Pregnancy. Excellence NIfHaC, editor. Manchester: NICE; 2011. Neilson J, Kilby M. Management of monochorionic twin pregnancy: Green-top guideline no. 51. RCOG, editor. London: RCOG; 2008. Denardin D, Telles J, Betat Rda S, Fell P, Cunha A, Targa L, et al. Imperfect twinning: a clinical and ethical dilemma. Rev Paul Pediatr. 2013;31(3):384-91. Weber M, Sebire NJ. Genetic and developmental pathology of twinning. Semin Fetal Neonatal Med. 2010;15:313-18. HFEA. Improving outcomes for fertility patients: multiple births 2015: HFEA; 2015 [Available from: http://www.hfea.gov.uk/docs/Multiple_Births_Report_2015.pdf. Hall JG. Twinning. Lancet. 2003;362(9385):735-43. Machin G. Non-identical monozygotic twins, intermediate twin types, zygosity testing, and the non-random nature of monozygotic twinning: A review. Am J Med Genet C: Semin Med Genet. 2009;151C(2):110-27. Hoekstra C, Zhao ZZ, Lambalk CB, Willemsen G, Martin NG, Boomsma DI, et al. Dizygotic twinning. Hum Reprod. 2008;14(1):37-47. Kurinczuk J. Epidemiology of multiple pregnancy: changing effects of assisted conception. In: Kilby M, Baker P, Critchley H, editors. Multiple pregnancy. London: RCOG press; 2006. Gremeau A, Brugnon F, Bouraoui Z, Pekrishvili R, Janny I, Pouly J. Outcome and feasbility of elective single embryo transfer (eSET) policy for the first and second IVF/ICSI attemps. Eur J Obstet Gynecol Reprod Biol. 2012;160:45-50. Jacobsson B, Ladfors L, Milsom I. Advanced maternal age and adverse perinatal outcome. Obstet Gynecol. 2004;104(4):727-33. ONS. Report: Live births in England and Wales, 2006: area of residence. London: 2006. Bulmer M. The biology of twinning in man. Oxford: Clarendon Press; 1970. Imaizumi Y. Demographic trends in Japan and Asia. In: I B, Keith L, Keith D, eds. Multiple Pregnancy. 2nd edn. London and New York: Taylor and Francis Group; 2005. p. 33-8. Nylander P. Ethnic differences in twinning rates in Nigeria. J Biosoc Sci. 1971;3:151-57. Basso O, Nohr E, Christensen K, Olsen J. Risk of twinning as a function of maternal height and body mass index. JAMA. 2004;291(13):1564-6. James W. Coital frequency and twinning. J Biosoc Sci. 1992;24:135-6.